I found David Lloyd-Jones Tree Morphogenesis Book 1 Reduction Via Thinning as an Amazon freebie, and was soon drawn into the book despite (or perhaps because of) its density. 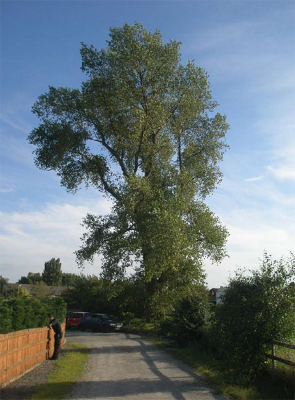 The author has spent the last 28 years as an arborist, pruning huge trees in a city setting in London. In the process, he developed his own theories about how trees grow and how we can prune them in ways that promote their natural growth rather than hinder it. The author's thesis is that the shape of wild trees is determined by what he calls growth phase shifts. What's that? Well, imagine a young tree: due to apical dominance (the highest bud suppressing everyone else's growth), young trees tend to shoot straight up if left alone. At a certain point, though, something damages that apical bud --- maybe wind, a spring frost, or a midsummer drought. This is the growth phase shift, when side buds get a chance to grow for a short while, until a new apical bud takes over. Each growth phase shift results in a complication in the tree's growth form, whether that means a double trunk or simply a larger branch that is able to compete with the central leader for a short time. From an arborist's point of view, growth phase shifts are important because they tend to create acutely-angled branch forks when two branches compete for the role of central leader. In contrast, when a tree is growing straight up, branches tend to come off at a more shallow angle since the upward growth of side branches is being suppressed by the central bud. As orchardists know, acute branch forks are weaker, and Lloyd-Jones goes through a long and fascinating hypothetical account of how evolution may have favored these acute branch angles because those branches snap off during heavy winds rather than taking down the whole tree. While most of you, like me, probably aren't planning on becoming arborists any time soon, homesteaders spend a lot of time thinking about trees, whether that's fruit trees, trees you're harvesting for firewood, or a woodlot you're managing to create prime lumber. And even though Lloyd-Jones doesn't speak to those topics specifically, understanding how trees grow will help us all do a better job managing those working trees on our homestead. Since the price is only $2.99 even if you don't catch the book on sale, you don't have much to lose from giving it a shot. It's $9.99 today so I put it on my Amazon wishlist. Fascinating info. Aggie --- Drat! I should have posted this yesterday when it was still $2.99! Hopefully it'll go back down. No problem, Anna. I'd have waited for it to become free anyway. Since giving up my traditional job, I really appreciate your cogent reviews. I'll put it on my wish list too. My house came with some standard fruit trees that were once topped with abandon. Hard to find really good instructions online for how to correct it. Maybe this book is the ticket! Hi Thank you for the review of my book, much appreciated. If the reviewer was also the person who left a review on Amazon (also mentioning fruit trees), double thank you and yes I do plan to do a fruit tree supplement for restoration of unsympathetically pruned trees as well as my own tried and tested way to manage fruit trees throughout their life. In line with my book my methods are to study the life strategies of the tree and then use them subtly to train the tree and all done with secoteurs. Sorry if any of you missed the free and discounted downloads. We will be having more of both in the near future but I was travelling in West Africa (tropical tree research, some of which will find its way into book 2). 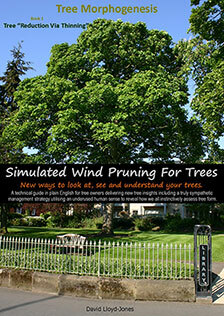 Now back we intend to have a free download for the tree owners of Cheshire and surroundings so if you connect with me on Linkedin or on the website, I will let you know when that will be. Again, thank you all for the comments. David --- Thanks for stopping by! Yep, that was me reviewing on Amazon (and goodreads) --- I always figure if I read an indie book that deserves 5 stars, I should share it widely. If you do write a fruit tree supplement and want me to review it, just let me know! I would like to invite you to grab a copy of the Kindle version for free this Friday. This offer is part of the pre-launch offer for the first edition of the large format printed version. If you have any doubts as to the value and usefulness of the information in this book, read the Amazon reviews. I want to help people to see trees with understanding and this book is designed to deliver that new understanding so please, grab yourself a copy but far more important than that, please do read it.